Last year I made Rainbow Cupcakes with a rainbow colored batter. They were topped with white icing, a star sprinkle rainbow and a chocolate gold coin. This year, I made the rainbow colored cupcakes but decorated the tops a little differently. For some of the cupcakes, I iced in a green buttercream and sprinkled on green jimmies/sprinkles. I placed the candy rainbow in the middle and then added the gold at the base. For the other cupcakes, I iced in blue icing and then added on the candy rainbow. 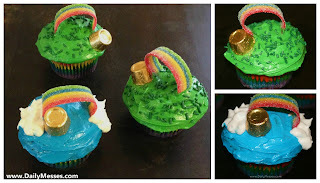 I piped on white icing for clouds at the base of the rainbow and finished by adding the gold candy. 1. Make the cupcakes and allow to cool completely. 2. Ice the cupcakes in the desired color. 3. Cut a three or four inch piece out of the Airheads strip. 4. 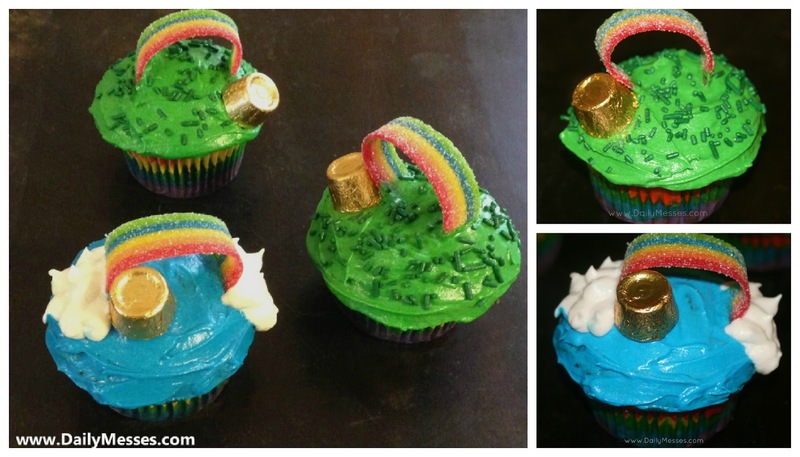 Place candy strip into the cupcake to create a rainbow. DM Tips: You could cut a slit in the cupcake and push the end of the candy in using a toothpick. You could also push the candy into the icing and pipe additional icing around the base to help hold into place. On the blue cupcakes, I used the white clouds to help hold the candy in place. 5. Finally, place a wrapped Rolo at the base of the rainbow. Instead of the Rolo, use a chocolate gold coin at the base of the rainbow. Ice cupcake blue, place on candy rainbow, and then place white mini marshmallows at the base for clouds. Have a cloud inspired cupcake by piping on white dots for a cloud-like look. Add a candy rainbow or rainbow covered sprinkles. Create a rainbow on a tray: Make cupcakes in the different colors of the rainbow. Place the red cupcakes in an arch. Then place the orange cupcakes underneath the red, then yellow, green, blue, and purple. You could pipe a dollop of white icing in the middle of the cupcake or ice in the same color as the cupcake. Ice the cupcake in white icing. Using sprinkles, create strips of color on the icing to make a rainbow. Yum! oh, why do I always give up sweets for lent? Wanted to let you know that I nominated you for The Liebster Award!